The melodic sound of the squeezebox accordion and scraping of thimbles on a washboard as couples glide around the dance floor (with the aroma of smoked bacon wafting through the air) gave me my first clue to why Lafayette, Louisiana was voted “Happiest City in America” in a recent Harvard University study. What a treat it was to explore this area with its unique style of living. Once we arrived in Lafayette, we were immersed in a different culture that sets itself apart from anywhere else in the United States. You have to experience all of it to truly understand all of its charm. The people of this region have a true sense of community and know who they are. 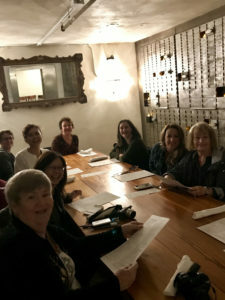 Let me share what we discovered as a group of food and travel writers. Lafayette has some of the most iconic Cajun restaurants in the South. 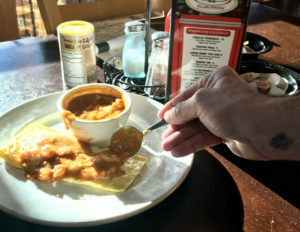 After a few meals in this wonderful city, I knew it was no wonder Lafayette was named “Best Food City in the USA” by Rand McNally and “Tastiest Town in the South” by Southern Living Magazine. Just to clarify what Lafayette food is, it’s not Creole, it’s Cajun. Cajuns cling to their French heritage and cook with the “holy trinity”—onion, celery, and bell pepper. Cajun food is considered more “country food.” Lots of spices are used; however, this doesn’t necessarily mean hot spices. Some of the most common spices are paprika, thyme and file (ground sassafras). Since Cajuns didn’t have access to refrigeration like Creoles did, they adapted by using smoke and salt. Two of the main crops in the area, rice and crawfish, are rotated as crops. Once the rice is harvested from a flooded field, crawfish are placed in the water to grow—true crop rotation. Our first stop was Chris’ Po’ Boys, voted best gumbo by Southern Living Magazine. Thick and deliciously spicy with chicken and sausage, we agreed this was amazing. Of course, we had to try a po’ boy and a muffuletta sandwich (marinated olive salad, salami, ham, Swiss cheese, provolone and mortadella in a French-style roll.) All of this yumminess is in a drive-in or eat in restaurant. bites and fried shrimp as well as the gumbo with rice. 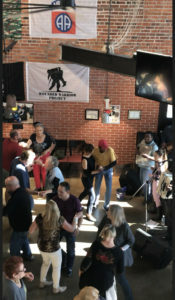 Shuffling of feet as couples tapped to the Cajun and zydeco beat around the large dancehall floor provided great entertainment and an introduction into the days to follow. Cafe Vermilionville stoically stands as the place where traders came by boat to the Pinhook Bridge to trade goods. This historic and first inn built sometime in the early 1800’s became the place they stayed. 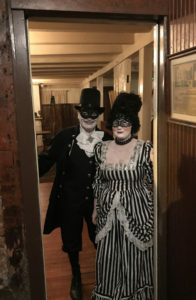 Since it was Halloween, we were greeted by the couple who own this delightful restaurant attired in garb of the era of the restaurant and inn. 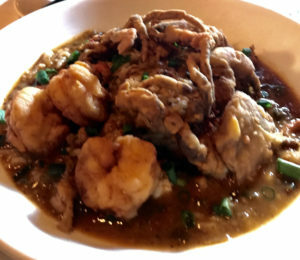 Bacon-wrapped shrimp and crawfish beignets brought a fresh twist on Cajun food. A couple of wonderfully prepared main courses our group tried were the Center-Cut Bone In Pork Chop with Sweet Potato and Andouille Hash (featured on the Cooking Channel) and the Gulf Fish Acadian, a pan seared gulf fish with fresh jumbo lump crabmeat and topped with corn and peppers. I recommend almost everything on this menu. the coffee is fresh and delicious. Flickering votive candles set on the ledges of bank safety deposit boxes provide an elegant setting at The Saint Marie, the dining room in the Vault tasting room surrounded by special reserve wines. 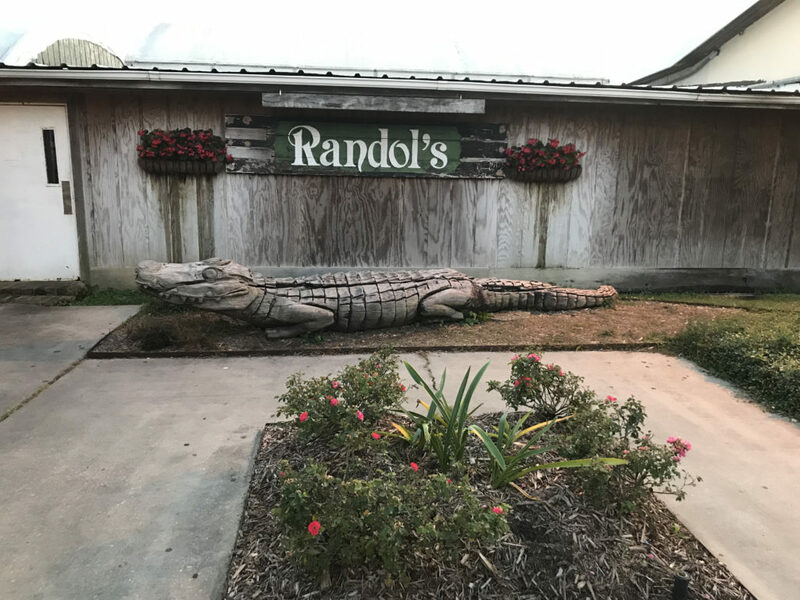 Do not miss their fried green tomatoes topped with grilled shrimp and house remoulade or the bakers’ dozen of gulf shrimp with Papa Tom’s grits and Monica sauce. Save room for the award-winning fried bread pudding po’ boy. has a reputation for pre-prohibition style cocktails like the Hemingway’s Death in the Afternoon. For me, nothing is more delightful than a table full of tapas. 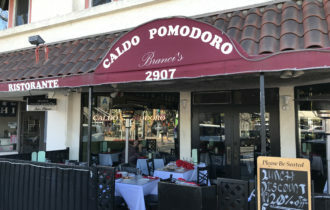 Try the Beef Carpaccio (tender slices of beef), the Spanish-style fried calamari with jalapeño lemon aioli and the Louisiana shrimp pan-sautéed in a spicy garlic broth. 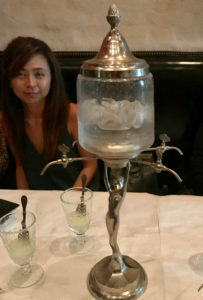 To add to this special night, ask for the Absinthe fountain that comes with a small glass of absinthe and a slotted spoon holding a sugar cube. Water from the fountain slowly drips over the spoon. What a treat. 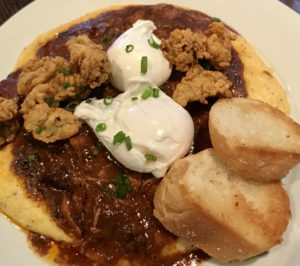 topped with Crawfish Etouffee and another entrée called “Don’t Mess with My Tasso”, an omelet with grilled onions and tasso (boneless pork, marinated and smoked) and topped with Atchafalaya cream sauce (a heavy cream and parmesan cheese sauce.) Sit back and enjoy the ambiance. For a little art in your dining experience, try Blue Dog Cafe. 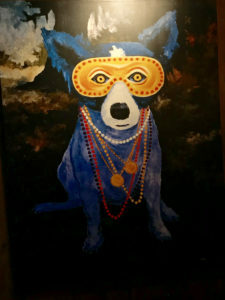 Original owner, George Rodrigue, is known for his artwork of Cajun culture and his iconic painted blue dogs. Executive Chef Ryan Trahan, Official 2018 King of Louisiana Seafood and 2018 King of American Seafood, offers a modern take on Cajun cuisine. 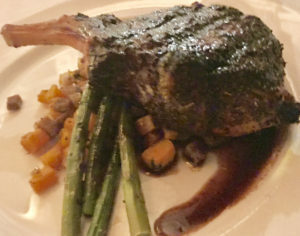 Try the Smoked Duck Breast with roasted eggplant dirty rice and grilled baby okra or the Chappapeela Farms Pork Chop with creamed corn mague chous (corn, bell peppers, onion and garlic), and pan-roasted peaches. If you are ready for a change of pace from Cajun cuisine, head to Bayou Teche Brewing, home to some mighty fine craft beers that started in a discarded railway car. These beers are named in Cajun French and are delicious. Try a flight to decide which one you like the most. 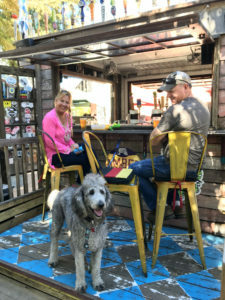 This place has a wonderful ambiance with outdoor picnic tables and live music as well as some of the best pizza anywhere. 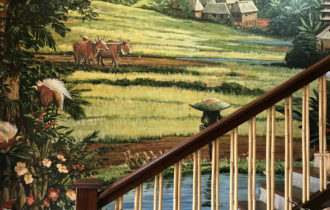 Check out the The Acadian Cultural Center and learn how this area began. Learn where Acadians first lived and their history in this area. Then take a walk around the 23-acre park on the bank of the Bayou Vermilion with restored original homes and local artisans providing demonstrations of crafts at Vermilionville Folklife Park. Did you know this area is the home of Tabasco? Tour the Tabasco Pepper Sauce Factory on Avery Island which originated in 1868. On exhibit is the growing process, the mash warehouse for aging, and the bottling and shipping process. 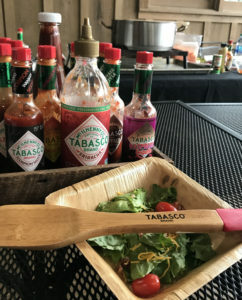 For a little added fun, take a cooking class by Chef Lionel Robin who shares secrets for Tabasco inspired Southern cuisine. You will even get a sample of ice cream with a splash of Tabasco. cuisine. Boudin is ground pork, seasonings, and rice all stuffed inside a casing. 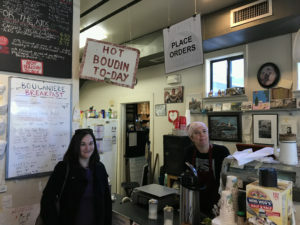 Boudin is a must for anyone wanting to experience Lafayette. Downtown Lafayette offers such an easy and walkable place to explore with its many parks, whimsical public art, galleries, and St. John Cathedral. If you happen to be in Lafayette in the fall, attend the Bach Lunch Concert Series. 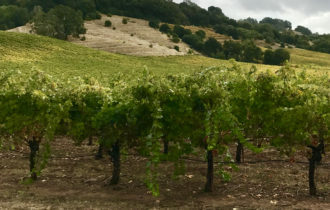 Wine tasting at MySomm gathers visitors to the area who want to learn from Ben Leger, Lafayette’s youngest Sommelier to pass the Court of Master Sommelier’s exam. His collection of wine is extensive from around the world. Spring and fall offer a chance to experience Downtown Alive!, Lafayette’s original street party in its 35th year. Witness music galore as well as plate lunches to go. I think all this music is why Lafayette is so happy. When you are looking for an interesting venue for entertainment, head to Rock ‘n Bowl. 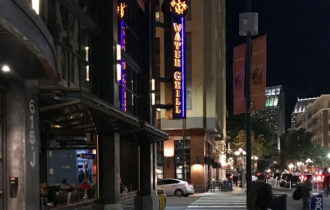 The downtown venue in a large renovated building includes 16 bowling lanes, a large stage and dance floor, The Sainte Marie restaurant, and a second-floor space for wedding receptions and private events. Talk about a place that has it all. What would a trip to this part of the country be without an airboat tour and sighting some alligators? Be sure to meet Sherie and Hercules. Captain Tucker with the Atchafalaya Basin Landing & Marina is the perfect guide for this airboat swamp tour. He grew up in the area and has loved the swamp all of his life. 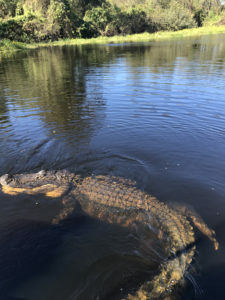 He even confided in us that when he was a boy, he and his brother brought baby alligators home to live in the bathtub until their mother told them the alligators were getting too big to be indoor pets. All the color of the swamp is brought to life by Captain Tucker. He was even seen stroking the belly of Hercules. Doubletree by Hilton Lafayette, with a view of the Vermilion River, has spacious and clean rooms. Doubletree concierges are very willing to accommodate your travel needs if they are within a short distance of the hotel, and they have a complementary shuttle from the Lafayette Regional Airport. There are lots of great benefits to this hotel such as a complimentary 24-hour business center, complimentary Wi-Fi, outdoor pool and deck overlooking the bayou, 24-hour fitness center, an on-site restaurant and bar, and a location right near the heart of the city. Take a trip to this unique city and enjoy all it has to offer. You will feel like you have stepped into another world. As is customary in this industry, I was hosted on this trip. It was a great experience. Loved Linda Milk’s article about Lafayette, LA! 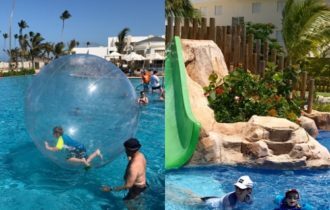 Both food and entertainment dsounds worth traveling to this area! Thanks for this information. It was so well written! Thanks, Rita. You should definitely visit Lafayette. It is a unique area and so much fun.